Elite: Dangerous - I need to feel part of you! 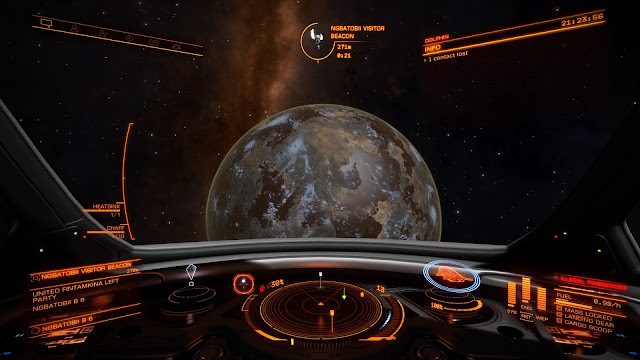 I know there are ways in which I could feel more involved in Elite: Dangerous. I could join a private group. Make friends with commanders, and get involved in their activities. However, I am a lonely soul and I'm not sure I'm ready for that level of involvement. I don't have the schedule to be responsible to other people in a group and ultimately I feel like I'd just end up letting them down. I need to feel involved in the game in a different way. And I think others do too. In fact I think they're silently screaming out for it. The other day, I was contemplating the comments I've heard about E:D. How people are enjoying the general experience of being in such a large sandbox, but not feeling any true sense of purpose. I think there are so many people out there who love the IDEA of E:D. But it's a game that unleashes imaginations, and meeting those high expectations is a monumental task. Then it hit me - I had an epiphany. I had been doing a lot of missions for factions aligned with the Federation. First I got the permit to enter the Sol system. Then I got some missions that allowed me to rank up to Chief Petty Officer with the Federation. Now I can purchase a Federation Dropship. 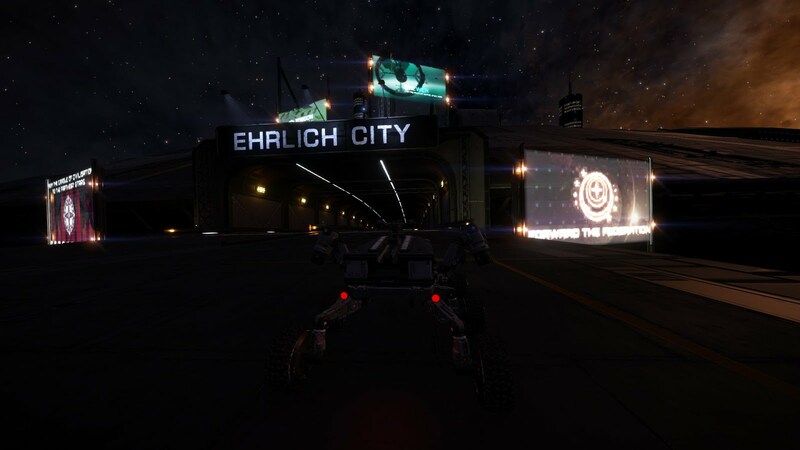 Did you know you can deploy your SRV and drive around when docked at Ehrlich City on Mercury? 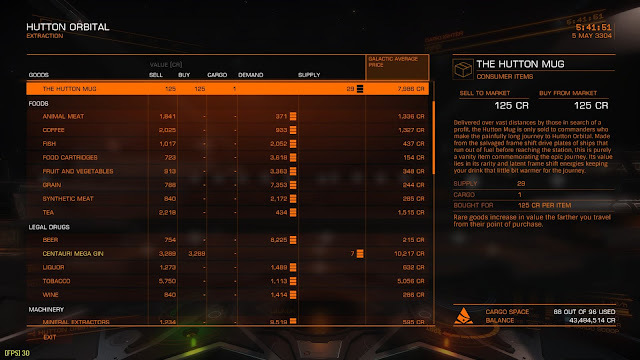 So I go to Erlich City on Mercury and notice that the Dropship is cheaper here: CR 12.8m. Next I travel to Mars High station, expecting the price to be the same, but no, it's regular price, over 1 million credits more: 14.2m. It feels weird that there is no pattern here. I'm at the Capital of the Federation and there's really nothing special about Mars High. And what perhaps surprized me most: At Mars High - one of the most civilized and controlled systems at the heart of humanity, there's a Black Market! That just feels wrong! What if there were places in the Galaxy you can only enter in a Federal ship? Special military stations where there are only Federal factions with a completely different agenda. Now I'd truly feel like I had progressed in the game. 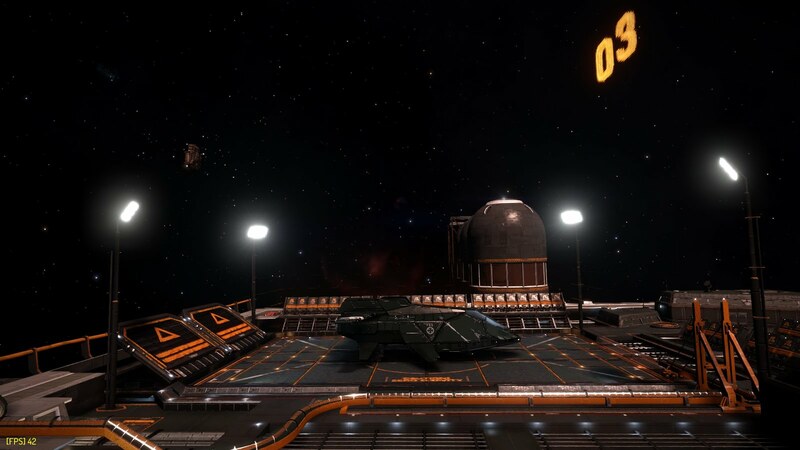 These stations would have a different look about them. Here you can only buy certain ship upgrades specifically for Federal ships. Here there are special missions and covert operations only for Federal allies. Here there are special commodities that need transporting and special projects to help the Federation further its reach. Here I would feel like I'm part of the Federation. And that doesn't just apply to the Federation. We should (and do) have Empire and Alliance stations. But these stations equally need an identity. They need to really FEEL different. And that even goes for the uncontrolled, anarchic systems. Stations out there should feel seedy and out of control. None of these suggestions seem like they're unreachable. All the elements are already there in the game to tighten it up and make it that much more like I can identify with the game and truly feel like I'm part of it. I truly think Elite:Dangerous is a game worth spending time with. But given the right tweaks it could be so much more immersive! I've been playing Elite:Dangerous for a few weeks now, and I must say that my second foray into the black was much more compelling than the first. I bought the first edition about a couple of years ago, tried a few basic missions and put it back on the shelf. Not through any lack of desire to play it, but more from a lack of time to dedicate to the pursuit and frustration that, as a MMO, it was not a game that I could pause at any time. One of my biggest barriers has been removed - you can save the game at any time in any location in space or on a planet's surface, unless you are in danger (meaning that you're under attack). This makes it so much more accessible to someone like me who has limited time to devote to it. There's one common sentiment that seems to resonate with this game and that is that it's "Not a game for everyone" and it's "Going to take some time to get into it - but there are lots of online resources than can help you." What's wrong with that picture? A game where you have to research how to play it online sounds more like a chore, a problem to solve, or a career choice - not a fun pastime! I really don't feel it needs to be that way. Even though it's not a "game for everyone", I think it could be wildly more popular than it is. And the fear is that the community is waning. I don't know for sure if E:D has a guiding principle for design, but I get the feeling that one thing they won't do is define your role for you. Phrases like "Play your way", "Plot your own course" and "Be who you want to be" keep coming up in their marketing. They seem to shy away from admitting actual Role Playing features, while continuing to add elements of Role Playing into the game. Holo-Me allows you to define an avatar for yourself. With the Livery you can paint your ship, add decals and even put decorations into your cockpit. (Other than major game module upgrades, of which Horizons is currently the only one, this is the only thing you pay for once you own the game.) 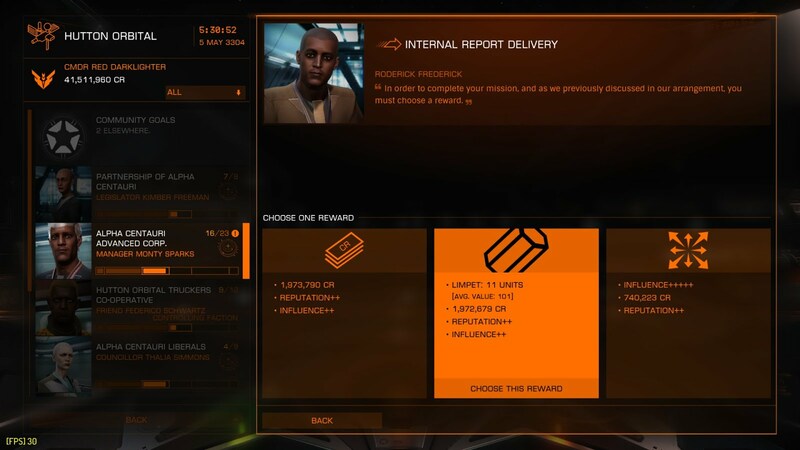 Faction reputation & influence allows you to define who you want to align yourself with and the type of missions you will undertake. Wings and teaming up allows you to play in groups with other players. Even though E:D has a back story and a lore, there are more stories developing in E:D. You could say that each player writes their own story. I'd love to see the E:D have a log so that you could review the systems you visited and remember the log of missions and activities you undertook. Elite can have its moments, for sure. But one of the challenges is that they are few and far between and the game can be merciless. For example, I'm going about my business collecting salvage from half a dozen systems. I get to the fifth system and I'm just about to collect my salvage when, suddenly I'm under fire. The signal said Threat 0. But without warning I'm being assassinated by a band of five pirates. Not only this salvage is now lost, but four other missions failed too, and without fair warning or ability to flee. Now that is drama. It is tension. But it is not fun! Players have stopped playing E:D for things like this. Frontier needs to do something about it. The kind of drama we want is situations where you realize you're in danger. Give me a stand-off situation - you can give me some of your cargo or I'm coming for you. You have 60 seconds to comply. Give us a module to call the police or signal for help. Give us a way to prepare to run. Give me a way to fight or flee with a reasonable chance of success. Because this whole idea of getting blown out of space in 5 seconds flat without fair warning is getting tedious. There's a massive amount of empty out there. Why can't a player claim some of it and start to build their own Empire? What a curve this would be! Find an unexplored part of the Galaxy, clear out any small factions that are trying to contend it, purchase/claim your own planet/moon. Start a coalition/group. Mine resources. Build stations around it. Start stocking it up for trade. As the money and resources roll in, start building outposts. Terraform your world. Build cities and commerce. Attract trade. And be ready to defend yourself! True Exploration (Atmospheric Planets - things to find, explore, go into, experience). Elite can produce some wonderful sights - planet-rise, landscapes on rocky moons. Passenger missions encourage us to go to tourist sights which are often just beacons in interesting locations, but can also be natural wonders such as Ice Geysers on planets. As the terrain becomes more interesting we can only expect the graphics and wonders to improve. We are all waiting for so much more - planets with atmosphere and weather and much more varied landscapes. Cities, oceans, clouds, vegetation and terrain. Strange, beautiful looking planet. Now wouldn't it be great if I could go down there! What E:D desperately needs is more things to fly into. Fly through. Canyons, Cave systems, Outposts, Cities, Landmarks. Race courses and tournaments. E:D continues to whet our appetites but in many ways it still feels like an elaborate preview. Even though it is at least a released game with actual gameplay, sadly, sometimes it does not feel much more involved than watching a Star Citizen demo. The original Elite was one of the first games that people bought computers for. It started on Acorn's BBC Micro and spread to the Sinclair Spectrum, Atari ST, Commodore 64 and PC. It was revolutionary. It has been claimed that for every BBC Micro sold, a copy of Elite was sold. In just 16K of RAM you could explore a procedurally generated Galaxy (in fact 8 galaxies, each containing 256 solar systems) with government systems, 3D space, stars, planets and rotating space stations. 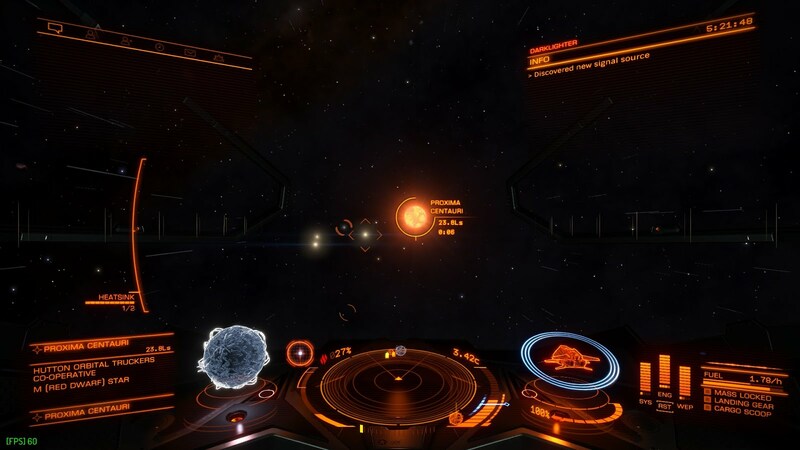 You could hunt pirates for bounty, trade goods between systems and scoop fuel from stars. Later editions allowed you to take on missions to further your career and rewards. True, the wireframe graphics were rudimenary, but any sort of 3D renderings were revolutionary for their time. But even more miraculously, Elite unleashed the imaginations of its players. Some even wrote novellas about their adventures in space. And we dreamed that maybe one day we'd be playing games with solid 3D ships, spherical planets (not just big hollow circles) and maybe we would even be able to land on those planets and even interact with other players? Just like the visualization of The Lord of the Rings, it has taken technology years to catch up with our imaginations. Subsequent attempts to expand the Elite Universe failed to truly impress. Maybe something to do with suspension of disbelief? 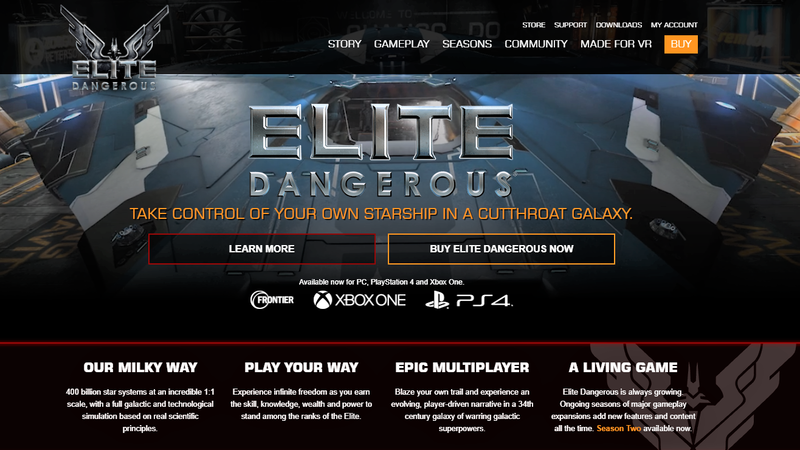 Elite: Dangerous (E:D) is what we were all waiting for. A vast galaxy of 400 billion star systems with highly detailed ships which can be kitted out for dog-fighting. A sensible travel system that ensures we can go from space station to space station in a sensible amount of time to trade and pick up missions. A strong economy-based universe in which you can trade, bounty-hunt, mine ore, explore, scoop fuel and salvage goods. And do this in an MMO environment with real friends and rivals online. Elite: Dangerous is capable of delivering epic moments. But it can also be a very lonely and sparse place to spend your time. The game was originally released more on it's promise to supporters and potential than on it's completeness. Only three years into its development are we truly seeing it come to fruition. And with the hype of Star Citizen hot on its heels you can see why the rush to market. Frontier Developments didn't have to worry quite so much because three years on and Star Citizen is still not released. However, in that three years we have experienced some significant enhancements to Elite, including planets you can land on, surface-based missions and engineers to add to your ship's crew to enhance your performance. Oh, and we can't forget THARGOIDs, the great alien threat in Elite lore. But let's not get too excited... Planetary landings are only on rocky moon-type bodies. We're still waiting for atmospheric worlds. Qualifying to impress an engineer requires you fulfilling certain missions and requirements. And you won't want to take on a Thargoid until you're deep into the game and prepared to make scores of inter-stellar jumps to find them. We're talking weeks of activity to increase your wealth. So this brings us to the thing that is preventing the adoption of Elite. Elite has always had this philosophy of throwing you into the great big Universe and letting you learn and figure things out for yourself. This Open Play concept is what contributes to the great sense of accomplishment you can get when you have the time to dedicate to it. However, it is also the greatest barrier to entry (and contributor to buyer's remorse). It is extremely disheartening to start getting to grips with the game, fulfilling some missions to make enough cash to buy your first ship upgrade only to be attacked by an merciless pirate who rips your ship apart in mere seconds and throws you right back to square one. Elite has training videos and some training scenarios, which are recommended as essential in all the "How to get started" videos and articles I've seen. But you feel like you have to watch them all and train yourself before you're ready to start playing. It's intimidating. What Elite really need is some hand-holding for new players. It needs to drop the open play idealism and teach people how to play the game. Not through anterior training missions, but by leading them into this wonderful universe in a way not dissimilar to a Role Playing Game. And the great thing is that it already has all the tools to do it! 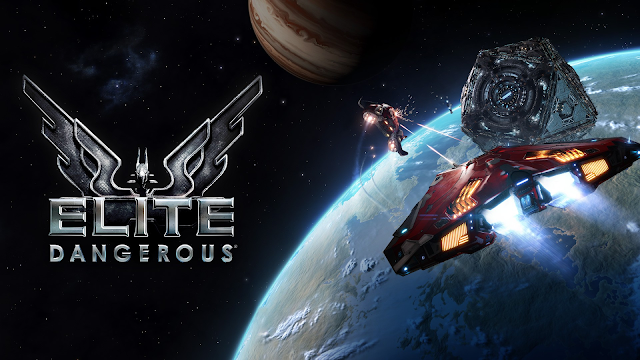 Anyone who has played Elite for a period of time, and stuck with it, enjoys the immensity of the game. They like trying out the different things to do. But the recurring consensus is that there is a lack of belonging. They would like more interaction. They would like to feel a sense of purpose. That they are working towards more of a goal than just being able to afford a bigger ship. When avid players, even fans, talk about the 'grind' of the game to achieve the next goal, we have to question whether they're really enjoying the journey? 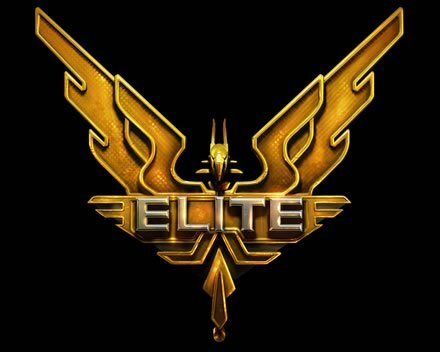 Elite as a game defined a genre. But since then, genres have been defined, created and refined. We can use some of this knowledge gain to improve on the potential of Elite. MMO's have struggled, but there are some elements that we can use to improve camaraderie between players. RPGs have been immensely successful, and there are many elements of this genre that can be applied to E:D. In fact, I believe Elite Dangerous has the potential to be the ultimate RPG in space. At the moment the party line is "define your own role". There is some fun in this, but a big part of the fun of a game is that you get to play a role, not define your own role. Come on, Frontier Developments, hire some writers: step up and become the story teller/dungeon master! You install Elite and the first thing you're presented with is "Welcome new recruit. There's a vast universe out there waiting to be discovered. There are many factions in need of new talent. Who would you like to join? The Federation. The Silver Rats Pirates. The Explorer's Guild. The New Stellar Corporation. Or just go it alone?" The Federation gives you an Eagle. The Pirates a Viper. The Corporation a Sidewinder. The Explorers an Adder. And a small budget to work with. Who you choose determines the first chapter of your story. But it does not define your path. Whoever you align with at first, will give you a basic ship, teach you how to handle it. You could be mentored by a basic engineer/trainer who walks you through the basics and gives you a few basic tasks: take out this drone, scan this ship, pick up this canister, dock with this station, mine fragments off this asteroid, scan this data panel. Then when you're ready, you can go it alone and you're given some story-based missions consistent with the faction you're being trained by: Take this cargo here. Locate and scan this ship and report back to us. Pick up this salvage. Go mine some ore and take the refined materials to this location for the space station we're building. This would create a safety net around new players. It would teach them the game through gameplay, not make them feel intimidated by the game until they've gone through all the training scenarios and videos. And once you feel confident you can continue your journey with the faction you started with, or break free and chart your own path to discover the wonders of the universe for yourself. I truly believe it would make Elite accessible and fun for a whole new generation, immersing them in both a compelling story and an uncharted universe. I'd hate to see E:D become the 'also ran' pre-cursor to Star Citizen, fading into Oblivion when the main act finally arrives on stage. It has so much potential to be the greatest game, deserving of so much more exposure and love than it now enjoys. Still 'open play', and less scripted than SC, but not a complete blank page in which you're expecting your players to write their own story from scratch. The original 1983 Elite included a novella to get you immersed into its version of the universe entitled "The Dark Wheel". Maybe this is the missing piece that E:D forgot? After the marathon that was getting Windows 8 onto my Mac, I am now finally in a position to comment on the usability of the desktop experience. It's nearly as painful as getting the thing installed in the first place! We used to talk about getting 'lost in hyperspace' on a website when we were left on a page with no links. Metro apps will give you the feeling of being left in a vacuum. After getting completely lost and not knowing where to go, you might start moving the mouse around the screen. The hotspots are in the very corners of the screen. There is no visual indication that the corners are hot and significant. You're somehow expected to 'know'. Without this knowledge, you'd be hard pressed to guess. You might be lucky and stumble across them. But why not indicate. It would be easy to highlight the hot corners with some kind of visualization as the mouse pointer neared the corner. Microsoft has gone for visual simplicity and clean interface to a fault here. Where ar the visual cues we need to follow our intuition? What would be wrong with just placing a start logo (or even a partial one) in the bottom left of the screen? What's more, when you finally get the bottom left corner trick, you get a thumbnail of the start screen. As a mouse user, you might, like me, instinctively, move away from the corner to click in the centre of the icon. However, if you move you're dead. The icon disappears and you end up clicking on whatever was behind it! Talk about punishing the user. It feels like a slap on the wrist for moving the mouse. Now, to get system level configuration options. Move to the top right or bottom right corner - to get a panel that fills the whole right-hand side of the screen. Why can't get this panel when I move the mouse to anywhere along the right edge, top middle or bottom? 3. No going back - I can't Escape! One of the most frustrating things I've encountered with Windows 8 is the feeling of hopeless isolation when I'm in a Windows application with no apparent way out. In just about every other environment I've worked in, the ESC key is my back-out clause. Not here. ESC does nothing. Try Backspace. Nothing. Try just about any other key. Hopeless. The last thing I try is the Windows key. (Command on my Mac!) Well, what do you know, I'm back on the home screen. Stuck in a application and I can't get out of it. Windows key - obvious, Not! All it does is toggle between Start and the App I was in. How do I get back to the desktop? 4. Displaying things that just aren't there! The finance app tile shows an article "Apple still has magic innovation", Strangely a woman handling meat is the thumbnail. On clicking it I find a feature article about horse meat being introduced into beefburgers in Europe. Nowhere can I find the article about Apple innovation. The only thing consistent about this UI is the blatent inconsistency. - scrolling up and down to go sideways. - In settings there are three word commands: Start Tiles and Help. But Start is disabled! At the bottom there are 6 icons: 5 bars (network) shows the name of the network connected to. Speaker (Sound) shows the volume. Sun (Brightness) shows the word Brightness - inconsistent. Card with greeked words (Notifications) shows Notifications. On/off switch icon (Power) shows Power. ENG icon (Locale/Keyboard) shows description US. If I change it to French (Canada) it changes the icon to FRA and the description to Keyboard! If I change it to English (Canada) Canadian Multilingual Standard the icon changes to ENG and the description to CMS. Underneath this it says Change PC Settings. 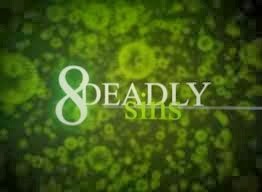 This might seem like a sub-title. But it's actually a clickable command! And what's more - it's the most significant command. And it appears last in the list, right-aligned. A sure way to imply that it's insignificant. - Pressing Windows key when the OS loads will do nothing. However, if you have an app open, it will switch to that app, and then pressing again will toggle back to the Start Screen. Why doesn't it just switch to the desktop instead of doing nothing? It's clear that Windows 8 is designed for touch screens. This may be Microsoft's biggest mistake yet. Their primary audience is clearly desktop users, but here we have a UI which is designed for touch, but 90% of the users will be on desktop PCs. If they had only spent more time testing this on desktop PCs using mice and not on their precious Surface tablets - which may end up selling less units than Blackberry's Playbook! 7. Right click - it's just not right! However, right-clicks on this beast are a completely different experience. Right-click with either yield no result, or give you a pop-up panel, usually at the bottom of the screen, with very few options. It feels like all the power in you middle finger has been taken away. Everything about search is wrong here. First off, did you know that you can start searching the PC just by typing on the Start screen? This might be a good thing, if Windows searched the whole system. For example, I had a problem with the screen brightness on my MacBook Pro being too dim. Search for 'brightness' - no results. But under Settings (just below the Search box) you can see that there's an option for Screen brightness, the very word I searched for! The search paradigm is all wrong here. The principle of type to search is very powerful. But the problem here is that all the search categories are on the right. It's hard to know straight away that your search is within a domain: Apps, Settings, Files, and other categories which look very much like Apps. The results appear on the main area of the screen on the left, but with your attention on the left of the screen, you don't intuitively realize that the control panel is on the right. Eventually you might realize that Windows-Q brings up the App Search, and Windows-F brings up File search. But they behave differently. As you type to search for apps, the Apps are filtered in the left hand pane. As you type to filter for files, the list appears underneath the search box, and the left pane remains blank, until you hit the enter key. Inconsistent and disconcerting! One of the reasons I finally pulled the trigger about a year ago on a > $2k Mac was the promise that I could run all current popular OS configurations on it: OSX, Windows and Ubuntu Linux. I finally parted with my cash in December 2011 (note that date - it will be relevant later), and my shiny silver MacBook Pro arrived just before Christmas. It took me a little while to get used to OSX, and one of my first projects was to fire up a VM or two. Being a bit cheap, I opted for VirtualBox instead of Parallels, a free product I had grown to like a lot while I was working at Sun (but is now owned by Oracle). Ubuntu was easy. Download the ISO, create a new VM and point it at the ISO. Done. So then I thought I'd finally use that Windows 7 upgrade disk I got shortly after purchasing my Vista desktop PC. I went through all my disks trying to find a full version of Windows. Finally I found one that would install so I could use the upgrade. After way too much wasted time, I had a Windows 7 VM on my Mac! My mistake was to get storage greedy and purchase an OptiBay drive enclosure. The idea is that you take out the little-used DVD 'super' drive and place a second hard drive in its place. You then place the DVD in an enclosure and plug it into your USB port when required. (Actually, you might need to occupy two USB ports, especially when writing to DVDs, because they consume more power than your average USB device.) Which brings me to another beef with my Apple - why only two USB ports? Would it kill them to put another one on each side of the laptop, making 4? Issue #1 - OK, I'm about to mess with drives here - better be prepared for the worst - where's my OS recovery disk? Can't find it. Call Mac support - don't need a disk - go to some obscure website and download the OS, create a recovery USB. "Why do you need it?" They ask. Innocently, I reply: "I want to install my own hard drive and install OS X on it." Apple guy: "It'll void your warranty." Me: "But I did my own memory upgrade." Apple guy: "That's OK, we let you do that - but don't even think about putting your own hard drive in, it'll void your warranty unless you get an authorized Mac Dealer to do it. and BTW, it can only be an SSD make & model we approve of, which you purchase through our Dealer." Seriously?! Forget that, I'm doing it my way. Issue #3 - Finally found right screwdriver bit - try again. Slot SSD into OptiBay slot and boot up. Drive is recognized - time to format it. Format successful. Check disk - disk has errors! What? Format it again. Disk does not have errors. Check again 2 secs later - now it has errors! What?!?@#?$?@! Browse forums - eventually discover that the Optical bay slot will recognize a 6Gb/sec drive, but doesn't support it - on my particular MacBook Pro 8,2 late 2011 model. Earlier models will accept the SSD and run slower, newer models will accept the SSD and run fine at full speed. See compatibility notes on this page. Solution: swap the drives. Finally with the SSD in the main slot and the HDD in the OptiBay slot I'm finally up and running with close to 1Tb storage. Issue #4 - Microsoft emails me offering Windows 8 Pro upgrade for $40, because I downloaded the release preview. Pretty good deal, no? Do I need it? Well it would be nice to dual boot - enter the wonderful mystery world of Apple's BootCamp. How will I get this onto Bootcamp? Plan A - Burn Win8 Preview to DVD, run Bootcamp, create Windows partition, plug in external DVD drive, re-boot and load up the Windows installer. Easy, right? Except Bootcamp won't let me proceed - no optical drive. Yes there is - it's plugged in right there! Forget this: reboot anyway. Disk whirs, blank screen. Wait several minutes. Disk spins down. Nothing. Hold down power button for a few seconds. Remove disk from USB port. Restart system. "No bootable media found - press key to try again." Insert USB drive again. Press key. Nothing - it's frozen. Reboot again. Same thing. At this point I'm really worried that I might be screwed. Thankfully I knew about the option key boot option. Restart system, hold down option key, breathe relief when your Hard Drives show up and you can get back into OS X. So what can I do? How about booting from a USB? Surely that works - many MacBook Airs and Pros don't have a DVD drive. Surely that must work. So I use Microsoft's Windows USB Loader program to create bootable USB. Plug it in. Try again. Nope! "No bootable media found." Then I find out you can also press the C key on boot to force it to boot from CD/DVD drive. Nope. "No bootable media found." Seriously? Burn gparted to DVD. Try again. Hold down C and gparted boots up Linux no problem. But not Windows. Hmmm. Search forums online. Some people can, some can't install Windows via Bootcamp. Then I discover that someone put their DVD drive back into the Mac - it worked! Open up Mac, replace HDD in optical bay with DVD drive containing Windows setup disk. Close up Mac. Reboot. Hey presto, the Windows logo appears! So the evidence here is that Apple has specifically locked MacBook Pros with Optical drives from booting via USB. What's with that?!! 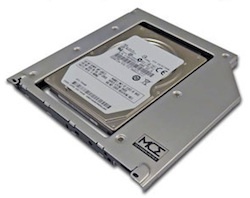 Put your SSD in the main drive bay, and if you want a second drive, place that in the optical bay, especially if you have a late 2011 MacBook Pro. If you took your optical drive out, and you want to dual-boot Windows, put it back in before starting Bootcamp. It will save you a lot of grief and time. If during setup, Windows doesn't recognize your Bootcamp partition, use disk tools in Windows Setup to format your bootcamp partition as NTFS before proceeding. Now I finally have Windows 8 on my SSD on my Mac, I'll be able to tell you what I think of it in my next post.